Denmark, Wodan/Odin-sceatta dated ca. 720-820 AD, struck in Ribe. Grading: VF/XF. 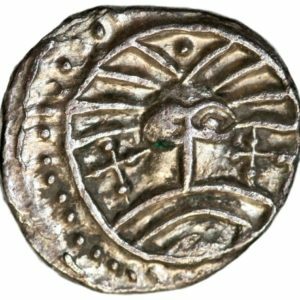 This coin type is Denmark’s and Skandinavia’s oldest coin type according to M. Metcalf. Reference: Abramson 103.10, SCBI 63 (BM), 446-51, cf. SCBI 69 (Abramson), 334–44 (for type), North 116, SCBC 797. Weight: 1,14 g.
Danish West Indies, 12 skilling dated 1763, struck under King Frederik V. Reference: H 5B. 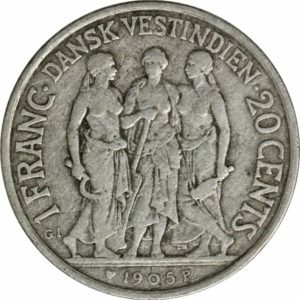 Weight: 2,98 g.
Denmark, no denomination (10 kroner «ministereksemplar») dated 1972. This «ministereksemplar», or cabinet member’s specimen, was given to the ministers and the royal family of Denmark in connection with the royal succession between King Frederik IX and Queen Margrethe II. 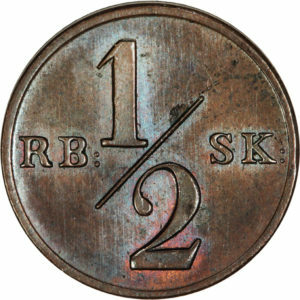 Therefore these coins are scarce. Grading: PROOF. Reference: Schou 16. 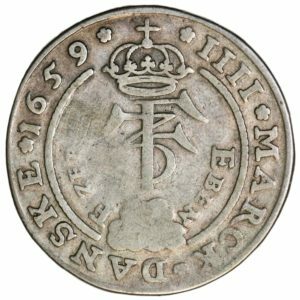 Weight: 20,5 g.
Denmark, 4 mark (Eben Ezer) dated 1659, struck under King Frederik III. Grading: F)(VG. Reference: Hede (1963) 100. 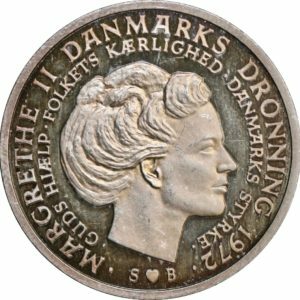 Weight: 21,02 g.
Denmark, 1 kroner dated 1892, struck under King Christian IX. Grading: XF / Mint State. Reference: KM 797.1. 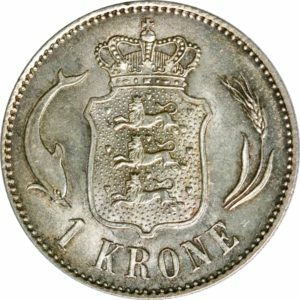 Weight: 7,5 g.
Danish West Indies, 20 cents dated 1905, struck under King Christian IX. Grading: F. Reference: KM 79. 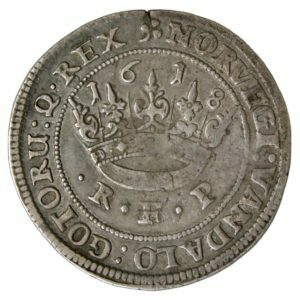 Weight: 4,95 g.
Denmark, crown dated 1618, struck under King Christian IV as the first crown denomination in Denmark-Norway. Grading: F/VF. Reference: Hede (1963) 106 A. 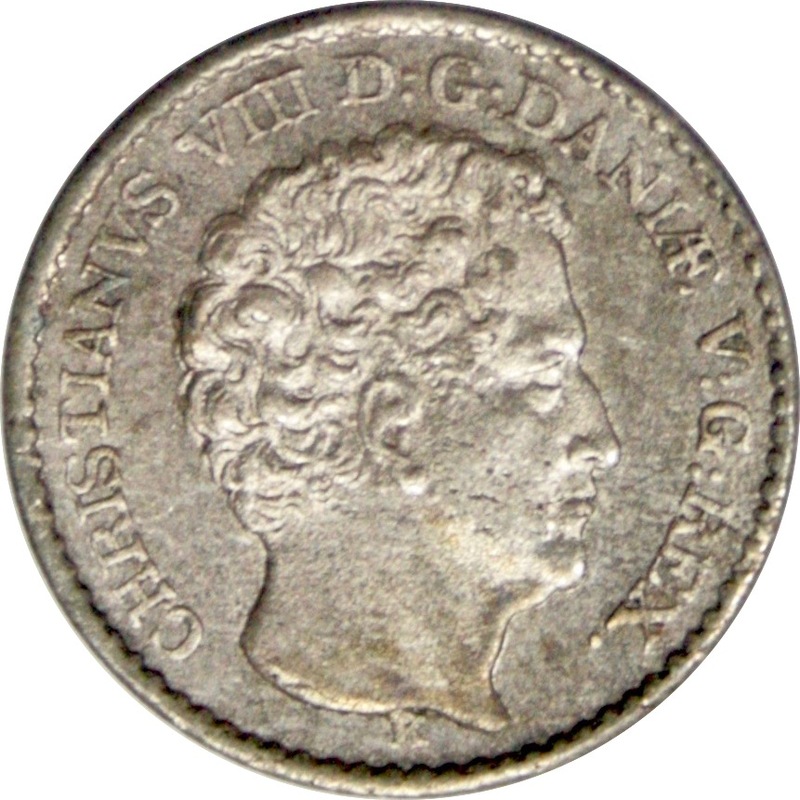 Weight: 18,34 g.
Denmark, 1/2 rigsbankskilling dated 1838, struck under King Frederik VI. Grading: Good Mint State. Reference:; KM 713. 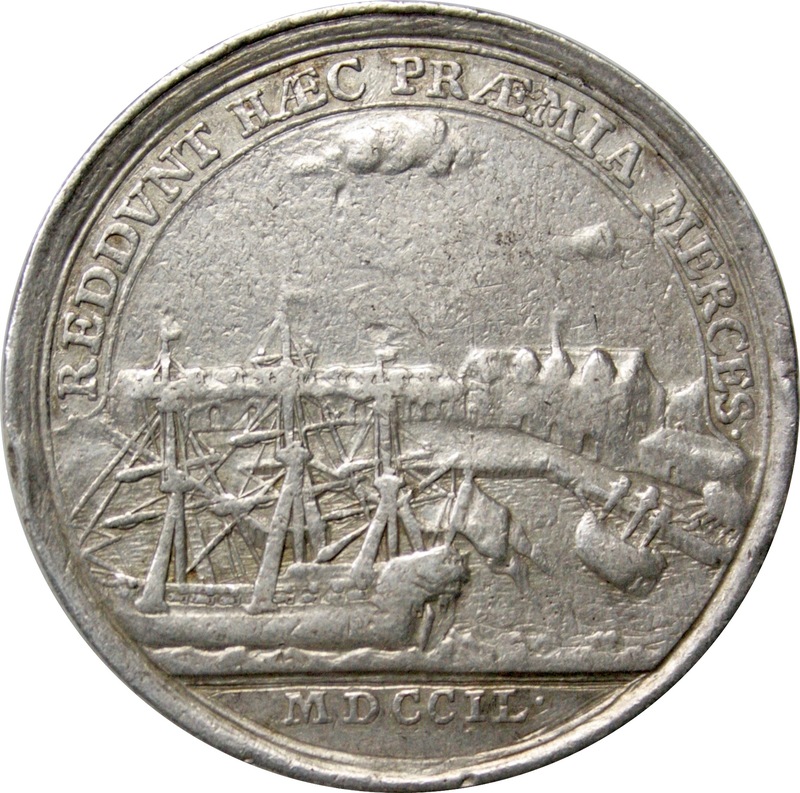 Weight: 3,62 g.
Medal from 1717, the 200-year anniversary of the reformation. Designer: Berg. 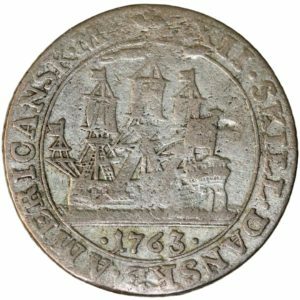 The medal was struck in 700 specimens and could be bought at the Royal Mint in Copenhagen. Grading: VF (gold plated). Reference: Galster (1936) 309. Weight: 29,94 g.
Denmark, 3 rigsbankskilling dated 1842, struck under King Christian VIII. Grading: XF. Reference: Hede (1963) 8. 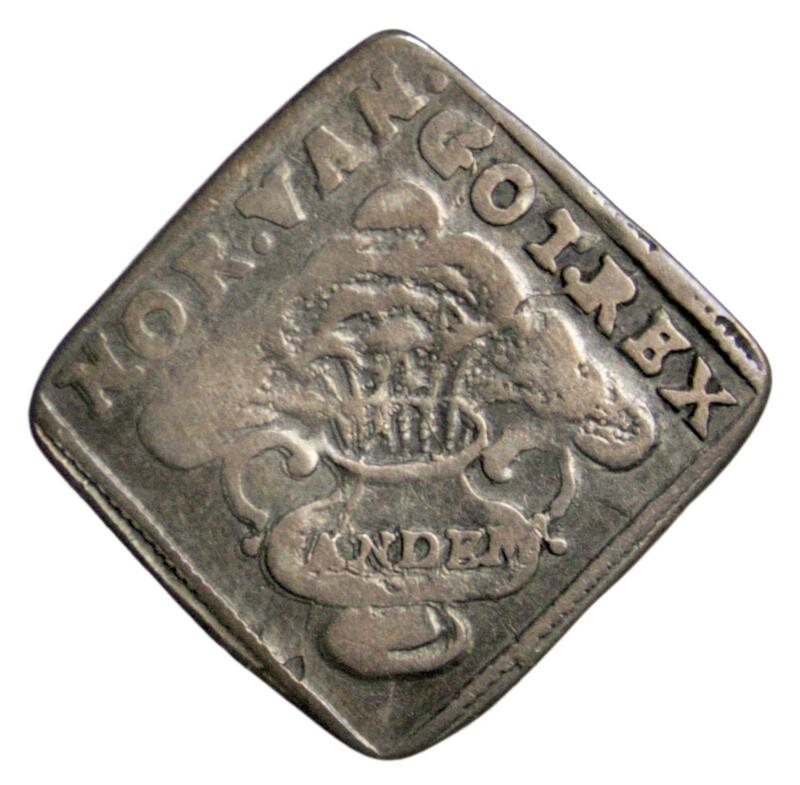 Weight: 1,55 g.
Denmark, 1/12 speciedaler dated 1648, struck to the coronation of King Frederik III. Grading: F. Reference: Hede (1963) 49. 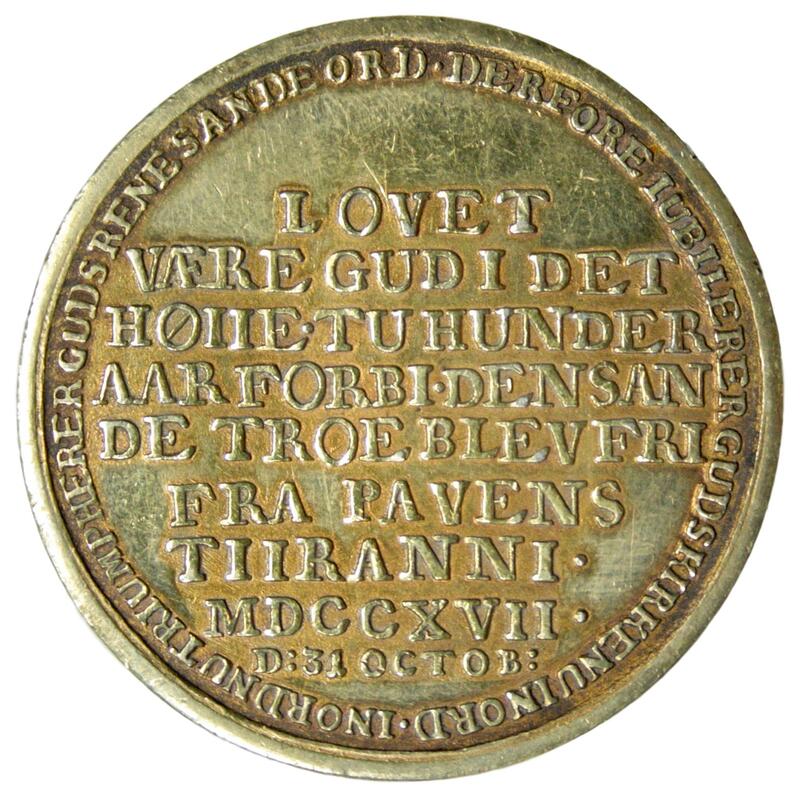 Weight: 2,21 g.
Denmark, medal dated 1749, struck under King Frederik V by medallist Wahl. 300 years anniversary for the Royal Danish House. Grading: F (edgenicks). Reference: Galster (1936) 397. Weight: 30,9 g.